Bottom Right: The industrial dishwasher... I could do with one of those! There's the buffet on deck 9, which serves food almost all day from really early to really late. It had different things every day and from what I tried, it was all tasty. Within the buffet dining area, there's the Pizza Pirate which serves cooked-to-order pizza round the clock (which is how Dave found himself consuming pizza at 4am after a night of drinking in the nightclub with our brother-in-law!). There are also a number of "specialty" restaurants on board, my favourite being Guy's Burger Joint (the crispy bacon patty was sooooo good!). There's also a Barbecue place, a sushi restaurant and fine dining at Nouveau on the very top deck. Then there is the Main Dining Room. Eating at the MDR is an experience in itself. The dining staff are fantastic and very attentive, and all of the food we had was really good. The menu was different every night, as well as having simple favourites for the less adventurous (think schnittys & steaks) and the ability to order a small selection from the fine-dining restaurant. By far though, my favourite thing about the main dining room was the food of the world entree that was different every night. I made it my mission to try most of them, and hands down my favourite entree was... wait for it... frog's legs. Yep, lightly fried frog's legs in a beautiful garlic sauce. They were so good, and tasted exactly how everyone says they taste... like chicken! 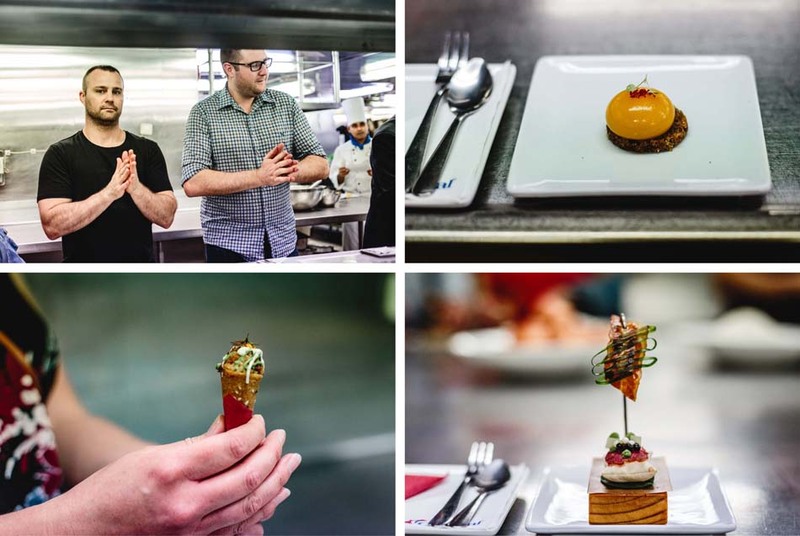 Sadly I didn't get a photo for evidence of my culinary adventure that night, but I did get photos from when we did a special tour & private dinner called The Chef's Table (disclaimer, the photos aren't great, especially of the food. Food photography is hard one-handed in very low-light!). After hearing about The Chef's Table in the Carnival FB forum I emailed to book myself, Dave, my sister & BIL in right away, weeks before we set sail. I'd heard that it was really popular and sold out quickly, due to their only being 12 guests allowed to join and I was so stoked to reserve our spots. 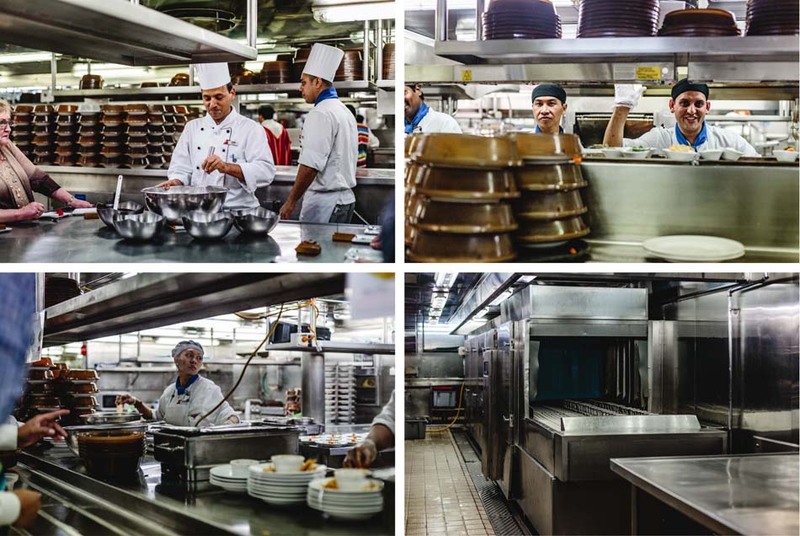 The Chef's Table starts off with a meet & greet with the ship's Head Chef and a tour of the Carnival galley. Seriously, the tour of the galley was worth the price of admission alone ($90 per person). We were taken through the galley and told all about how the kitchens on the Carnival Spirit work. It was absolutely fascinating, and the amount of food that they go through on each cruise was mind-boggling! I would not like the Stores Officer position, let me tell you! While touring the galley we were given a private "masterclass" on how Carnival's signature dessert, the Melting Chocolate Cake is made, as well as being treated to 4 delicious canapes, one of which had the most amazing chocolate bacon (seriously, bacon cooked with chocolate!). Again, fascinating! One thing I found interesting was hearing how they deal with waste on the ship. They are very, very strict with their hygiene and waste & disposal protocols and there are severe consequences for crew who do the wrong thing. It was very interesting to learn that all of the soft food waste is pureed and then released when the ship is at least 12 nautical miles offshore as fish food! 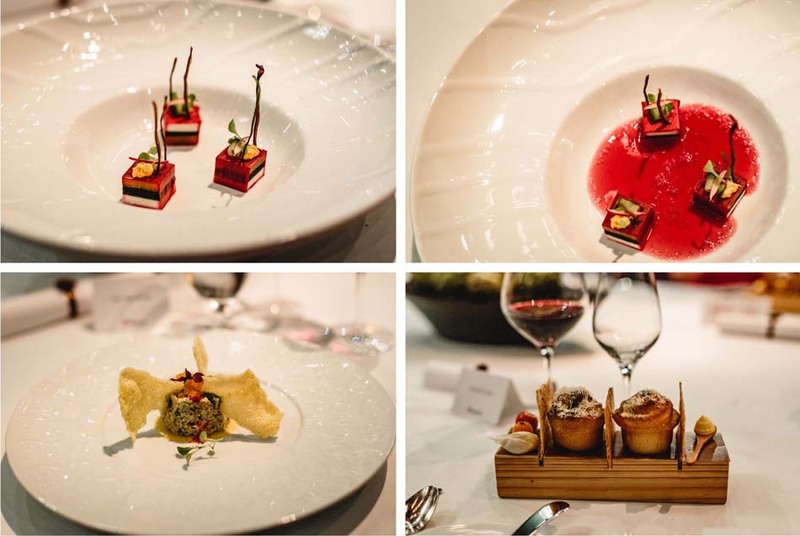 After the canapes and galley tour, we were then taken to a private dining area in the ship's nightclub to enjoy a 7-course degustation menu with unlimited wine (oh yeah!). As each course came out the chef would talk to us about the food and how it was cooked, as well as share interesting stories and facts about life as a chef on a massive cruise ship. All of the food that we were served as part of the degustation was amazing, including the special bread that was brought out and wasn't even considered a part of the 7 courses! It was a really fun experience and one that I would definitely do again if I was to go on another cruise. It was also really great for the 4 of us to get a night off from the kids, thanks to my Mum & other sisters taking on babysitting duties for us. On our final morning onboard we also did something really fun called the Green Eggs & Ham breakfast. If you haven't read Dr. Seuss's iconic book then you really won't appreciate this breakfast, but the girls loved it. 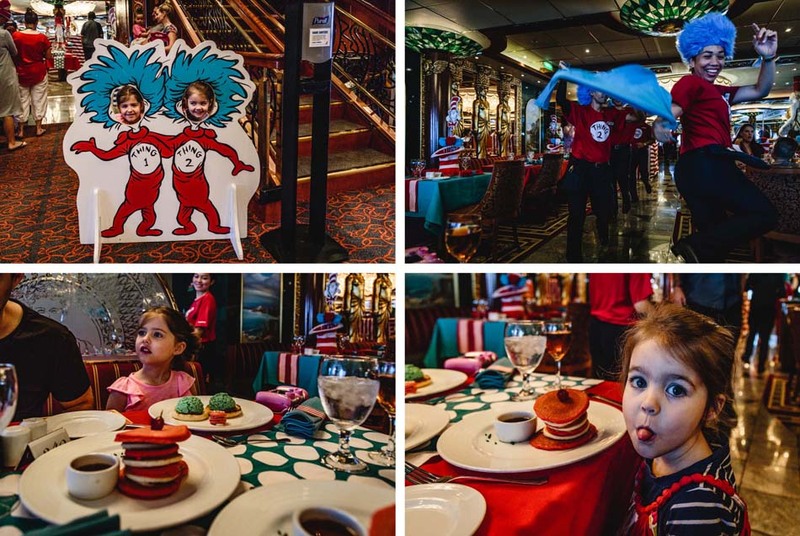 As well as enjoying green eggs & ham and red & white pancakes for breakfast, they also got to meet some of their favourite Dr. Seuss characters, including The Cat in the Hat. In conclusion... the food onboard the ship was great! 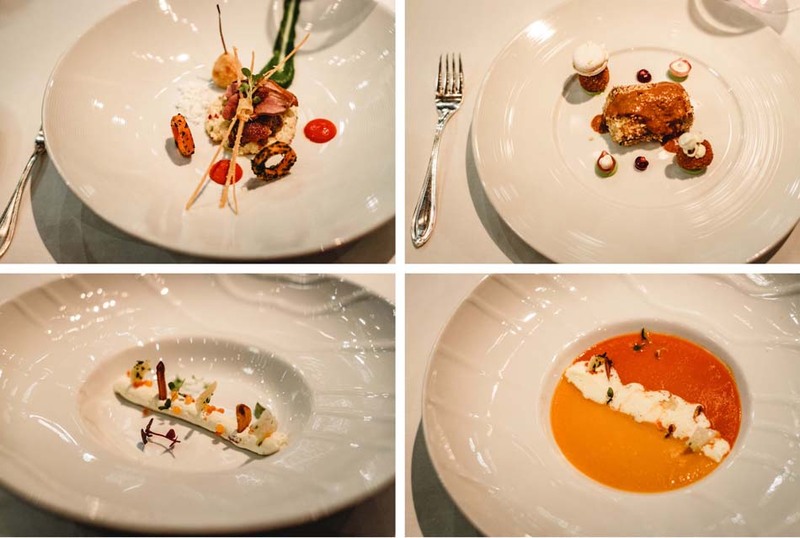 If you ever do a cruise, I can't recommend taking part in The Chef's Table enough, (I know other cruise lines do them too but I'm not sure what they call them) it was one of the highlights of our holiday! And the Green Eggs & Ham breakfast is pretty special too! 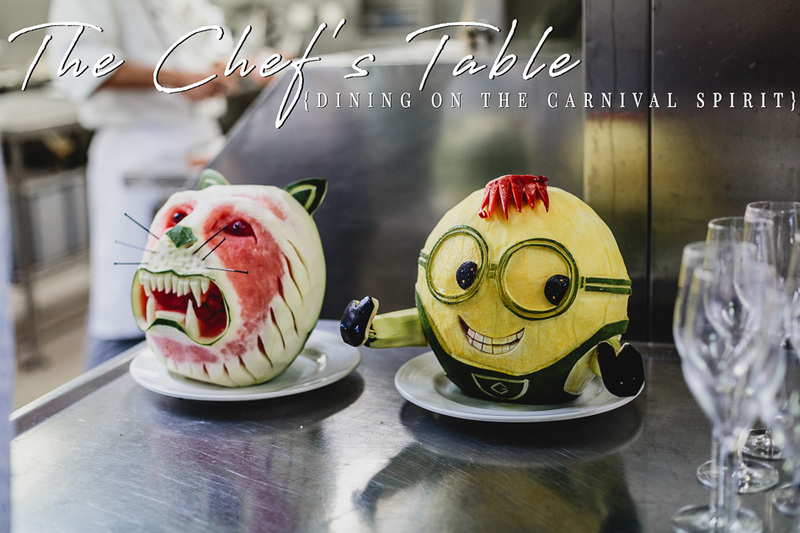 Would you do The Chef's Table or eat green eggs while cruising? What's the strangest thing you've ever eaten?